We repair home appliances and are at your disposal for routine service and the installation of new units. 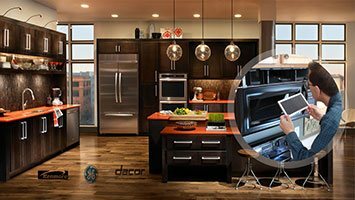 What we do at our Appliance Repair Service in Los Angeles CA is support our clients and cover their needs as fast as possible. Appliances are installed to provide convenience and make house chores easy and not to burden families with extra problems. But their parts wear over time. Washer parts might break. Dishwasher components might corrode. Fridge coils will get dirty. But each and every time you will need professional home appliance repair, we'll be there to serve you. We serve the entire residential Los Angeles area. Our vision at our Excellence Appliance Repair Service is to help you save energy, minimize problems, eliminate hazards, and make room for more free time for you. Wouldn't you prefer spending time in the Museum of Contemporary Art or in any other gallery in Los Angeles instead of mopping the floor after the dishwasher overflow? Our appliance repair service team can maintain your home appliances, but also help you with such urgent problems. When it comes to urgent appliance repair requests, we come as soon as possible. Trust that our techs are always fully equipped with diagnostic tools and the best spares in California in order to do their job properly. We can service any home appliance, ranging from every kitchen gas or electric unit to washers & dryers. Need help with your oven, microwave, or stove? Need emergency fridge repair or freezer service? Leave any repair work to our specialized appliance technicians. Each of our appliance service technicians is updated and well trained. We are also experienced and certified to do any repair work but also to install innovative appliances. Want gas range installation? Need routine clothes dryer service? As home appliance specialists, we can repair and install any gas appliance and do so with great attention for your safety. We also service dryers as soon as possible and will be there to help you with any problem with your refrigerators but also small appliances. Depend on our Los Angeles Appliance Repair Service for every one of your needs and enjoy peace of mind.